At Dan-Gulf the responsibility doesn't always end at the dock. We provide full service to our clients, which in many cases includes inland transportation or transshipping of their cargoes. Whether you require a single barge or entire fleet, one railcar or an entire train, Dan-Gulf can coordinate the logistics to get your cargo to the site safely and economically. 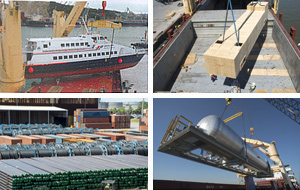 While we specialize in heavy lifts and over dimensional pieces, we can assist you with general cargoes, containers or even a single truck load.